Let me emphasize once again that the services you want to disable are only and only dependent on your needs. Apart from that, if you're absolutely not sure about the working of a service—simply—skip it! 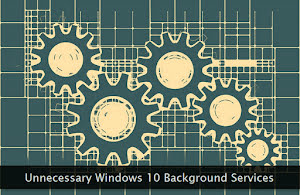 If you're using a home desktop PC or a Windows 10 laptop and that too far, not attached to a local network, almost all of the background services mentioned below can be safely disabled. If you're either not using smart devices (e.g. smart bulb) in your home or simply doesn't want to control them through your PC, go ahead and disable this service without giving a second thought. In the future, if you ever install smart devices in your home, enable this service again to manage them easily while sitting in front of your computer screen. The name of this service itself hints at its functionality. Privacy-focused users should definitely disable this service—without any fail. This service collects event-driven usage pattern data. This data is sent back to Microsoft to assess and analyze how the users are using the Windows system on a daily basis. This assessment is used to improve the Windows platform. This service maintains the file links on an NTFS volume both locally and on the local network. The file links work correctly even if they're renamed or removed. Generally, a normal user never needs this service and one should disable it—altogether. If you're using links to a lot of NTFS files on a local network, you may want to use this service. This is yet another service associated with data collection and telemetry. Though by default, it starts on a manual basis, I'll strongly recommend disabling it on your computer. Even Microsoft's official documentation places no objection on disabling this service. This is one of the first services I disable on a new Windows 10 PC to strengthen the privacy of the user. If you prefer to use Google Maps within the web browser and never use Microsoft (Bing) Maps, you don't need this service. This service facilitates access to the downloaded maps for the relevant applications. If you're never going to use such kind of apps, disable this service. It's completely safe to turn-off and doesn't affect your system performance in any way. Now this one is a no-brainer. This service adds Fax sending and receiving capabilities to the computer. For a typical home user, it is of no use. It's better to disable it. In fact, in this modern era, even offices are relying less on Fax services. If you ever want to use this service, make sure both the print spooler as well as the telephony services are active as well. If your Windows 10 PC is connected to a local network and you often access network folders both in online and offline mode, this service is essential for you. Otherwise, disable it. Most home computers are standalone systems and therefore do not need this service at all. In case, you ever decide to use this service, make sure the offline cached files are stored in encrypted form. This feature was first introduced in Windows Vista. At first glance, it may look like an absolutely essential service to the parents who're worried about their kids accessing the internet. But nowadays, you can exercise and control content filtering both at the DNS and browser level. In fact, one can also use specialized software for the same. So, I'll recommend you to disable this service. If you're using Windows 10 Pro and have created custom group policies for the removable mass storage devices, you may use this service. But generally, this is not the case with a typical home computer. Therefore, I'll strongly advise you to disable this unnecessary service. Remember, it won't affect your general USB stick usage unless you create custom group policies for the same. If you love to run legacy or poorly maintained applications on your Windows 10 PC, you may need this service. This service checks for compatibility problems while installing an application. In most cases, you'll never need this service so it is advisable to disable this service. I've myself have not disabled it because I use a few legacy applications on my PC. This service enables remote users (with enough privileges) to access and edit the PC's local registry. Naturally, in almost all of the cases, we never need this feature. For your computer's safety and security, I'll recommend disabling this service. Your local registry editing operations are not affected by this service—in any way. This service is generally used by retailers and vendors to run the PC in the demo mode to showcase the operating system's features to the potential customers and resellers. It's quite obvious that the customer himself will never need to run his PC in the demo mode. Therefore, go ahead and disable this service with confidence as it's not going to affect your computer's functioning. This service is often used by a non-privileged account to temporarily use a privileged account (without logging off) to run and complete a specific task. It's somewhat similar to Linux sudo command. For most home users, this service is of no use. Because it has no dependencies, you can enable or disable it in the future—without any issues. I keep it disabled and advice the same to you too. If your Windows PC is connected to a local network powered by NetBIOS over TCP/IP, this service is essential to facilitate smooth network operations. It's basically a legacy networking protocol. Nowadays, the NetBIOS protocol is not used on modern computers. Therefore, one can disable it. Especially, standalone Windows PC should disable it as this service is of no use on such systems. Once again, the name of this service gives you a clear hint that what it is all about. This service facilitates the functioning of the touch keyboard and handwriting operations for touch-enabled screens. If your Windows 10 PC does not have a touch-enabled screen, this service is useless for you. In such a case, you can disable it—right away. On my PC too, I've kept it disabled. This is one of the important services listed here one must disable on his PC. This service generates the error and diagnostics data logs for the applications installed on your Windows PC. This data is sent to both Microsoft and to the relevant third-party entities. Therefore, it is strongly recommended that you disable this data collection and sharing service. If you're not connecting a scanner or a still picture digital camera to your PC, this service is not needed at all. If it's the other way around, you may need this service to acquire images from such devices. If you keep this service in its default state, it starts automatically upon detection of a device which relies on it for proper functioning. If you're planning to buy such a device, do not disable this service. The Windows Insider Program enables savvy users to run and test upcoming builds of the operating system before it is available to the general public. A typical home PC user prefer to run the current and stable version of Windows. Therefore, this service is definitely an unnecessary one and should be disabled. I keep it disabled too. Now, this one too is quite obvious. As the name implies, this service provides authentication support for the users using Xbox Live. I'm not a gamer so I don't need this service at all. If you're in the same boat, disable this service. If you're playing standalone game applications on your Windows PC, then too, you can disable this service—without any worry. This game data saving and syncing service associated with Xbox Live is only needed if you're using this very gaming platform. Otherwise, you can disable it altogether. This service is dependent on the service mentioned right before this one. If you're going to use this service, make sure the other one is enabled as well. I keep both these services—disabled.